A common sight in Inkwenkwezi National Reserve is a herd of Giraffes on the opposite crest of the hills silhouetted against the blue African sky. 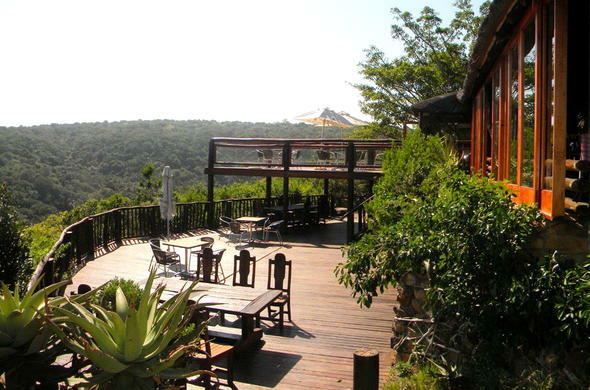 At Inkwenkwezi Reserve you can enjoy African sunsets and experience true tranquility, while you are surrounded by hills and valleys. This reserve is the ideal venue for your wedding in the ultimate of privacy. The reserve boasts its own thatched open-air chapel with a red carpet laid out for the bridal couple. This chapel is situated under an old wild fig tree in paradise garden settings with waterfalls, streams with rapids and small ponds. Strategically placed lights light up the garden at night. Situated in the malaria free Eastern Cape, Inkwenkwezi is only a few minutes from the magnificent golden beaches of the Indian Ocean. A variety of Antelopes as well as Zebra, Giraffe and the rare White Lion occur in this reserve. Driving to Inkwenkwezi is a pleasure as all roads are tarred right to the reserve's entrance.